When you find the divine promise of each day, you can face whatever it brings. Speed bumps and speeding tickets won't derail you. Hiccups and hard times don't have to ruin your day. In fact, those days can become great days. Whatever you face, you can have a great day every day. 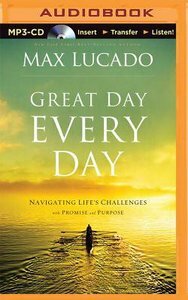 About "Great Day Every Day (Unabridged, Mp3)"